This is one of my very first digital compilations. The tower is actually as portrayed; i.e. I did NOT add the word GRACE. I had stumbled across it on a winding rural texas road on the way to legendary Lukenbach on very hot summer. I don’t remember why I had infrared film loaded, but it certainly added to the feel that attracted me to it in the first place. The ghostly figure was from another series in a completely different setting and with normal film; I remember the thrill of digitizing these photos (by scanning the prints) and learning how to isolate the figure and import her to her place under the the tower. It is I believe the first black & white digital image to which I added color digitally. 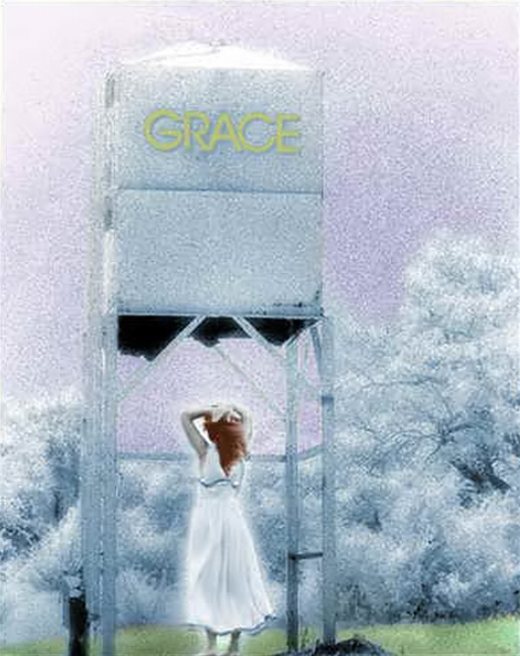 It had very personal significance to me – I was listening a lot to Carolyn Myss in those days and she would use the phrase “send your grace” to anyone you might want to pray for…so it was quite the visual metaphor for me.